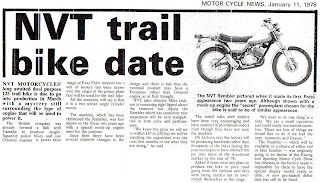 My Motorcycle Restoration Diary & Notes: NVT125 Pre Launch Article in Motor Cycle News, Jan 1978. 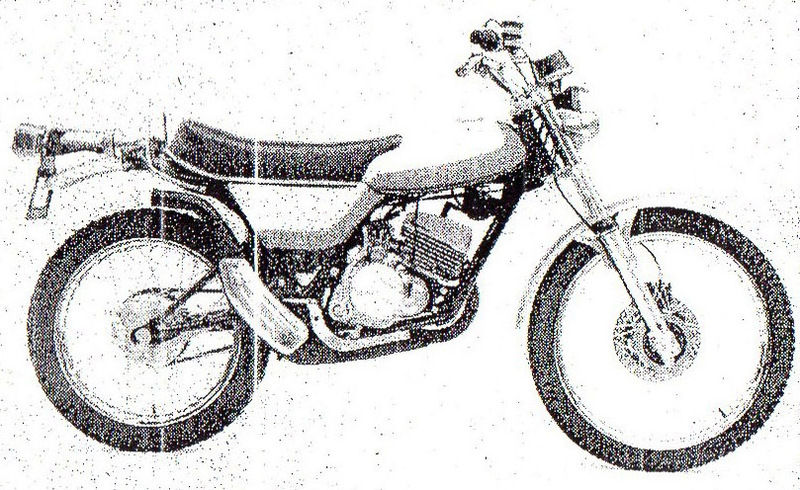 A Diary Following the Restoration of my 70's & 80's Motorcycles & Associated Notes & Ramblings. Mainly Yamaha & Trail / Trial / Enduro Biased. 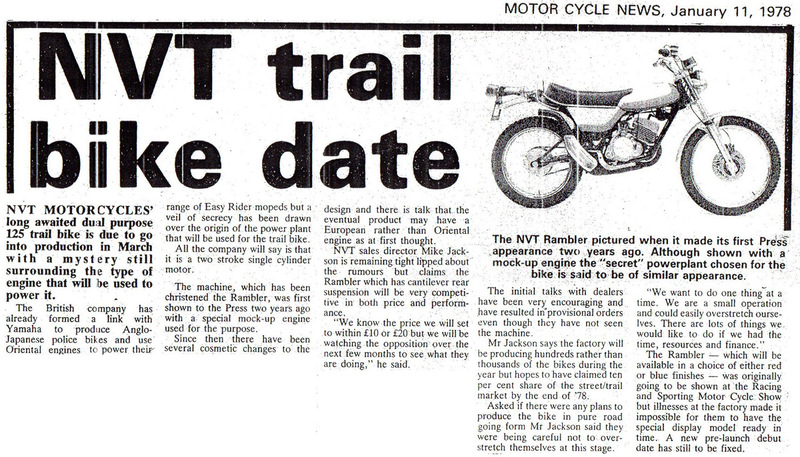 NVT125 Pre Launch Article in Motor Cycle News, Jan 1978. MOTOR CYCLE NEWS, January 11, 1978. NVT MOTORCYCLES’ long awaited dual purpose 125 trail bike is due to go into production in March with a mystery still surrounding the type of engine that will be used to power it. The British company has already formed a link with Yamaha to produce Anglo-Japanese police bikes and use Oriental engines to power their range of Easy Rider mopeds but a veil of secrecy has been drawn over the origin of the power plant that will be used for the trail bike. All the company will say is that it is a two stroke single cylinder motor. The machine, which has been christened the Rambler, was first shown to the Press two years ago with a special mock-up engine used for the purpose, since then there have been several cosmetic changes to the design and there is talk that the eventual product may have a European rather than Oriental engine as at first thought. NVT sales director Mike Jackson is remaining tight lipped about the rumours but claims the Rambler which has cantilever rear suspension will be very competitive in both price and performance. "We know the price we will set to within £10 or £20 but we will be watching the opposition over the next few months to see what they are doing," he said. The initial talks with dealers have been very encouraging and have resulted in “provisional orders even though they have not seen the machine. Mr Jackson says the factory will be producing hundreds rather than thousands of the bikes during the year but hopes to have claimed ten per cent share of the street/trail market by the end of '78. Asked if there were any plans to produce the bike in pure road going form Mr Jackson said they were being careful not to over stretch themselves at this stage. "We want to do one thing at a time, We are a small operation and could easily over stretch ourselves. There are lots of things we would like to do if we had the time, resources and finance." The Rambler - which will be available in a choice of either red or blue finishes - was originally going to be shown at the Racing and Sporting Motor Cycle, Show but illnesses at the factory made it impossible for them to have the special display model ready in time. A new pre-launch debut date has still to be fixed. Note the pre production exhaust shape on this image Other than that, it looks pretty much as produced. If you need parts for your classic Japanese bikes, take a look here. CMSNL have full parts diagrams, and an enormous range of parts available. I use them regularly. The last one I owned was the NS125, and I sold that in c1992. The H2 is a story I'll tell another day! Classic Dirtbike Magazine - excellent read! VinduroUK - Vintege Enduro News and Info - Fantastic site! Vintage Trials - Nice site worth keeping an eye on. Yamaparts - A site dedicated to vintage small Yamaha's from 60's & 70's. Need Used or NOS Spares? UK - North Leicester Motorcycles - Morini Specialists, can supply parts for NVT front end. UK - YAMBITS - Many parts for Yamaha's from '70's on. USA - MotorSport - Site with UK prices, and parts diagrams that highlight price on roll over.